Go ahead and pull out all things purple, green, and gold. Mardi Gras is on its way! Festivities are under way all over the country for this joyful celebration, especially in New Orleans. 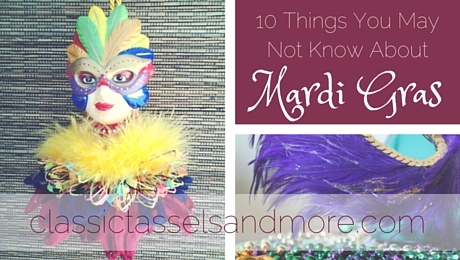 You may automatically think of beads, parades, and parties when you think of Mardi Gras, but did you know these fun facts? The Mardi Gras King Cake, so named in honor of the three kings who visited baby Jesus on Epiphany, includes a plastic baby hidden inside the cake. The person who finds the baby is responsible for either providing the king cake or hosting the Mardi Gras party for the next year. Epiphany, Carnival, and Mardi Gras. What do they all mean? Epiphany is the Christian holiday that celebrates the Magi’s visit to Jesus. Mardi Gras refers specifically to the Tuesday before Ash Wednesday. And Carnival marks the period of time between the two. The traditional Mardi Gras colors of purple, green, and gold were not chosen because they made a wonderful party palette. They were selected by the Krewe of Rex in 1892 to honor a Russian royal family visiting New Orleans. But the colors do stand for something: purple represents justice, green represents faith, and gold represents power. What’s a krewe? They are the organizations that put on a parade or ball during the Carnival season. In early Mardi Gras celebrations, masks were a means to break free from class constraints, allowing wearers to socialize with whomever they chose. Today, it is illegal to ride a Mardi Gras float without a mask.. The origins of Mardi Gras can be traced to medieval Europe, but it is generally accepted that the first celebration on American soil happened in 1699, when French explorers landed in what is now Louisiana. The Big Easy isn’t the only place to celebrate Mardi Gras. If you won’t be near New Orleans next month, maybe you’re close one of these celebration cities. You may also hear Mardi Gras described as Pancake Tuesday. Pancakes are a common treat during Mardi Gras due to the tradition of using up fat, eggs, and dairy before fasting and abstinence for Lent begins. How do you celebrate Mardi Gras? Check back with us next week when we will share tips for hosting your own Mardi Gras party! Next postNational Chocolate Cake Day (Jan 27th): Which Cake Would You Bake?